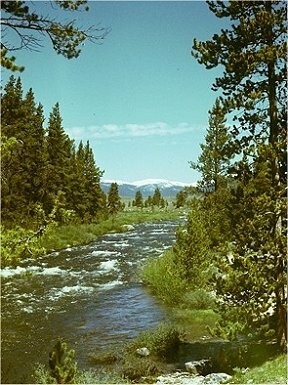 When I was 10 years old, my father took me on a weekend fishing trip to the Taylor River, a then unspoiled, infrequently fished stream deep in the Rocky Mountains near Gunnison, Colorado. It was teeming with trout, or so it was said. I was anything but an accomplished fisherman, and though I tried to follow my father's good advice, especially as it pertained to spotting likely areas for trout to be in, I didn't catch a single fish the first day. On the other hand, Dad did. He seemed to know, somehow, where to cast his line, how long to let it float in the current, and when and how fast to reel it in. His creel was full by the end of the day. I was obviously missing something but didn't know what. It was difficult enough to keep my line from getting tangled, but I also recall being almost overwhelmed by the noise. Mountain streams, if you've never stood on the banks of one, roar. Fishing is often characterized as an almost contemplative sport, but stand inches away from a torrent of icy, foaming snow-melt in what sounds like a college football stadium on a Saturday afternoon (or an FOL sale) and try to think about anything, anything at all. It isn't easy. The second day we walked up river some, stopping now and again to fish at promising spots. About mid-day we came to a cliff that rose perhaps several hundred feet above our heads. It wasn't possible to walk along the river bank anymore, so we climbed. This is where it all changed for me. For one thing, it was suddenly quiet; for another - and this may have been the neatest thing I'd ever seen in my 10 short years - you could look down into the river. Not at it; into it. What had looked like a boiling, almost black channel at ground level now, when viewed quietly from far above, was a wide, calmly proceeding, startlingly clear, sun-browned body of water, and what’s more, there were fish! At first I didn't see them because they weren't moving. Dark, long shadows looming, invisibly quivering over the gravel - from our viewpoint, perfectly still. Then one moved, darting quickly to gulp a fly floating by, and instantly resumed its stillness. So. This was how it was. The fish were not only there but, despite a strong current, motionless. And I thought they'd been passing me by, swimming with the current! I was so captivated by the image of this that, when we descended, returned to the banks of the roaring Taylor, I brought this mysterious and new-found tranquility with me - the stillness of trout - also the certain knowledge that the fish I hadn't been able to see before were now quite real and, most important of all, quite within my grasp. Waiting. Just as I was waited on the bank each time I cast my line. It was the river that was moving, not us. I became a trout fisherman in that moment, possessing a calm knowledge that guided me in every subsequent cast. In Penny Marshall's 1992 film "A League of Their Own," women's baseball recruiter and deadpan comedian Ernie Capadino turns to one of his hesitant recruits at the train station and barks, "Are you coming? See, how it works is, the train moves, not the station." It's perfectly natural to think of life in terms of movement, getting on trains and going places, doing things, but isn't there something to be said for stations too? Standing in them? Letting trains leave without us and still getting somewhere? Think along these lines, for a moment, in terms of a Friends-of-the-Library (FOL) sale. If you've been to one, especially one of the big ones, you might think that it's all about movement, and frantic movement at that. 100's of competing booksellers swarm onto the floor in the first moments, grabbing books as fast as they can reach for them. There's no time to waste, and if you hesitate, don't at least stay abreast of the current, you might be left with nothing. In situations like this, it would seem that luck plays a big role. You can't be everywhere at once, and if the first table you choose to go to nets you nothing, by the time you get to the second table, you may have lost out on a few of the best things. Get to the third, fourth and fifth tables, and everything good might be gone. At least this is a common perception. But consider this: have you ever had the experience of hurriedly glancing at a table or shelf of books, grabbed a few promising titles, and then later returned, less hurried, and discovered that you'd overlooked things? Sometimes better things than you grabbed in the first place? Of course you have. We all do this, time and time again, but I believe that, when it does happen, it's because we're not in the right frame of mind going in. The reality is that we see differently in different frames of mind. Let's look back at the trout fisherman now, the inexperienced one who senses that fish are zinging past him in the current. He feels that he must cast quickly and in lots of different places if he's to have any chance of catching something, not knowing that this very approach will more likely net him nothing at all. Contrast this with the fisherman who, in a quieter, more knowledgeable state, understands that things are more clearly seen in stillness, not in motion, that fish themselves are often still, and that he need only approach them in this frame of mind to have some success. FOL sales are often intensely competitive, and because you're severely limited in how quickly you can cover a floor of books, I don't believe you have the luxury of thrashing in the current, hurrying from table to table, even though it may seem to be the most efficient use of time. Your chances of success are better if you're able to distance yourself from the motion, quietly and deliberately look for things, especially those things other booksellers may have overlooked in their agitated states of mind. If you're able to this, you'll have a competitive edge over most of your competition, and though there may still be no getting around the luck factor, over time you'll do better.